If you come to my office you will see a rock that was given to me as a reminder to never forget the battle against cancer. I appreciated the thoughtfulness of the person who made the kind, albeit unnecessary, gesture. Any one who has dealt with cancer on a personal level REMEMBERS. 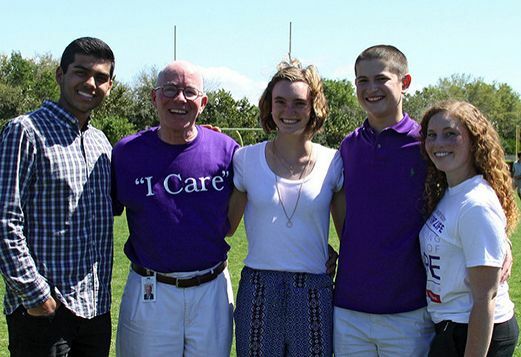 A year ago at this time, the Shorecrest Community rallied behind the Relay For Life efforts because one of our own outstanding students and high performance cross country and track athletes, current junior Olivia Rovin, had been diagnosed with Hodgkins Lymphoma. When someone as healthy, active and talented as Olivia is diagnosed, it is a reminder that we are all vulnerable to cancer. A year later, Olivia and her family can celebrate that her treatments have worked, she is cancer free and running better than ever before! Our community joins her family in celebrating her cure and her fight - but we remember that others are in the battle with cancer and more will follow. One has to be a dedicated optimist to join the fight against cancer. It is a complex disease. We Relay because we have Hope and we believe there are CURES that will support current and future generations. On Friday, April 8, the Shorecrest Community will gather from 6pm to midnight for a party with a purpose. Relay For Life is a time for great community bonding, great opportunity to raise money to fight cancer and a great time to reflect on the progress and future progress American Cancer Society and other dedicated researchers, and doctors and volunteers are making to provide hope and encouragement. ARE YOU A CANCER SURVIVOR OR CAREGIVER? A special honor is paid to survivors & caregivers at our Relay. You will be treated to a delicious dinner compliments of El Gallo Grande and seated in the shade of our decorated tent. Come and be a part of this fun and important evening!